The above was the script followed in the Skripal affair. The "deadly nerve agent - of a type developed by Russia-" did not kill at all. Now a similar case happened. Ukraine's Prime Minister Volodymyr Groysman has accused Russia of being behind the killing in Kiev of the Russian journalist Arkady Babchenko. "I am confident that the Russian totalitarian machine did not forgive him his honesty and principled stance," the prime minister posted on Facebook. 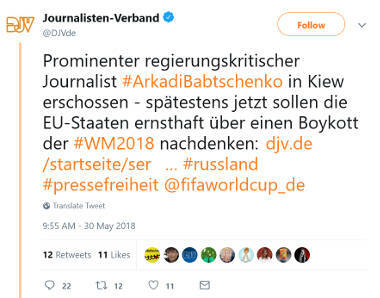 Despite lack of any evidence that Russia was involved, one German union of journalists, the DJV, demanded a EU boycott of the worldcup soccer championship in Russia . But the case was murky. 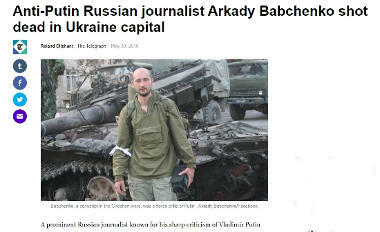 Babchenko was critical of all Russians who did not protest against the Russian involvement in Syria and Ukraine. When the TU 154 with the Red Army Choir crashed and 64 choir members died, Babchenko said that it did not bother him. In his eyes those too were guilty people. That did not make him any friends. When he moved to the Ukraine he was just as cynical towards the people and the Ukrainian government. He raised harsh accusations against the Ukrainian President Poroshenko. Many common people hated him, many issued threats. After his murder was announced and everyone had had time to "blame Russia", contradicting tales of how the murder happened emerged. Babchenko was killed by shots in the back or front, the public was told. He was killed while either leaving the apartment or while coming home, depending on which sources the media spoke to. He died in place or in the emergency vehicle. Not even the number of shots that had hit him was consistently reported. The police did not get the story straight. Then news broke in Kiev that the police had been in Babchenko apartment block hours before he was killed. They had manipulated the CCTV. Something was deeply wrong with their story. Now it turns out that Babchenko is alive and well. No one shot at him. An hour ago he appeared in a press conference (video). The internal Ukrainian security service SBU said it had created a stunt together with Babchenko. It says that this was done to catch someone who had threatened him. Says he had to stage his own murder in order to capture someone, apologises to his wife. #Babchenko: "Special apologies to my wife. Olechka, I am sorry, but there were no options here. The operation took two months to prepare. I was told a month ago. As a result of the operation, one person has been captured, he is being held." 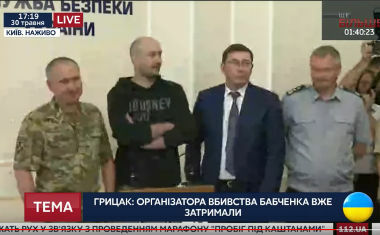 #Babchenko, smirking on live TV, says "I did my bit of the job. I'm still alive. Didn't give you the satisfaction." This will not go down well for Babchenko or the Ukraine. The Ukrainian Prime Minister officially accused Russia of killing the man. But it turns out the the Ukrainian state faked the murder. Babchenko comes back from the dead, proving that the accusations against Russia were false. Just as one false claim is undone the Ukrainian security service says that Russia ordered the failed assassination? Why would anyone now believe a word of what they say? Russia should be happy. 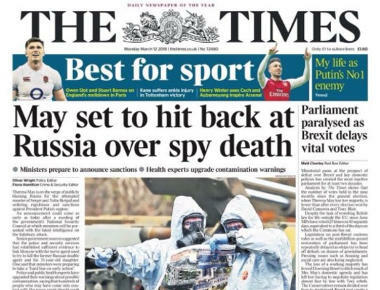 Both affairs, the Skripal and the Babchenko stunt, have been proven to be factless propaganda against Russia. 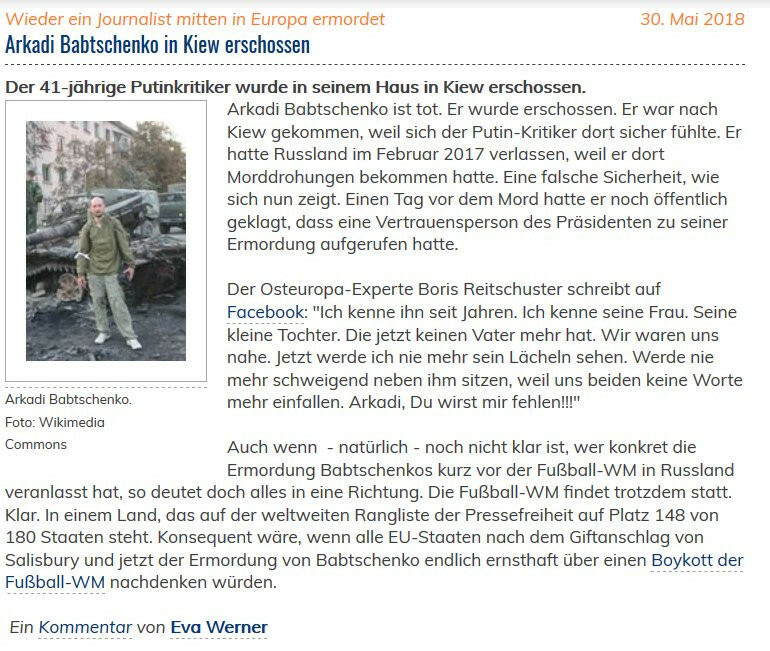 The German "journalist" union deleted its tweet and an editorial (pic) demanding sanctions against Russia from its website. Tomorrow it will be back attacking those who say that such "journalism" is fake news and propaganda. More people will wake up to these obvious manipulations. They will ask questions. The usual accusers will have to become more cautious in raising their propaganda claims. Their propaganda "killings" will - in the end - kill their propaganda.